To protect against accidentally adding invalid stale addresses to your audience, you can import contacts as unsubscribed to create a suppression list. Each audience in your Mailchimp account is separate from the others, so your suppression list won't be global. You'll need to create a separate suppression list for each audience in your account. In this article, you'll learn how to set up a suppression list from a CSV, TXT, or Excel file. Suppression lists only require an email address field. Make sure your suppression import file does not contain additional fields or subscriber information. This suppression list process can't mark existing contacts as unsubscribed or cleaned. To mark existing subscribers as unsubscribed, use the bulk unsubscribe tool instead. To import a suppression list, follow these steps. Click the Manage Audience drop-down and choose Import contacts. Click CSV or tab-delimited text file to import from a CSV file or tab-delimited text file, or click Excel file. To upload a CSV or TXT file, click Browse and choose the file from your computer. To import from Excel, copy and paste your contacts into the field provided. If prompted, click Continue in the Are You Sure? pop-up modal. Note this only applies to active subscriber imports. Your suppression list doesn't affect your billing tier. Click Next to review your import. Review the settings for your import and click Unsubscribed. Do not check the Update existing contacts box. We'll display a success message to confirm your import. To view your suppression list at any time, open your audience and click the Email Marketing column, and sort by subscription status. Or, create a new segment with these conditions: Email Marketing Status | is | Unsubscribed. Create your Mailchimp audience so you can import and collect new contacts for your campaigns. 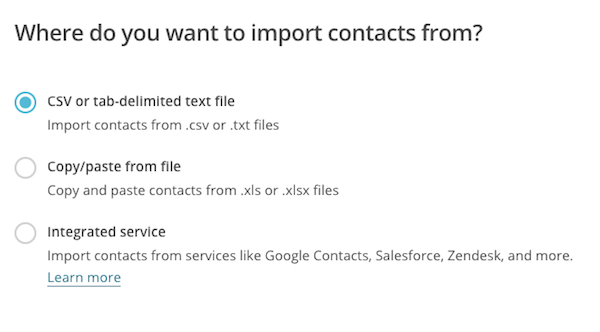 Learn how to use our import tool to add or update contacts in Mailchimp. Learn how to unsubscribe contacts individually or in bulk.